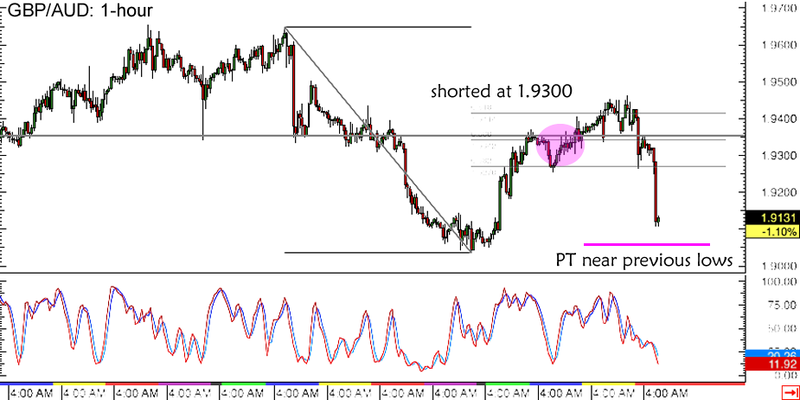 Boy am I glad I took a chance on this GBP/AUD short forex trade setup! Of course there are a couple of points for improvement but overall, I’m happy with how I managed this one. As I mentioned in my initial trade idea, I thought of shorting at market prior to the release of the U.K. CPI figures. Most of the inflation readings came in below expectations, supporting my downside bias, but I only risked half my usual position size ahead of the Chinese data dump the next day. I was able to short at the 1.9300 major psychological level, which was right around the 50% Fibonacci retracement level and broken support area. I set my sights on the previous lows near the 1.9000 handle but stayed ready to exit early in case fundamentals don’t turn out in my trade’s favor. I also briefly considered cutting losses when price popped higher after China’s retail sales and industrial production reports posted bleak readings then re-entering prior to Australia’s jobs release. Then again, I figured I’d sit tight while price is staying below the Fib levels since I have a pretty wide stop at the 1.9600 mark anyway. Fortunately, Australia’s employment readings beat expectations and led to a sharp selloff for GBP/AUD earlier. Unfortunately, I wasn’t quick enough to add to my short position! But a win is still a win, right? Even though I only risked 0.5% of my account on this forex setup and I’ve got just a 1:1 return-on-risk, I ain’t complaining!